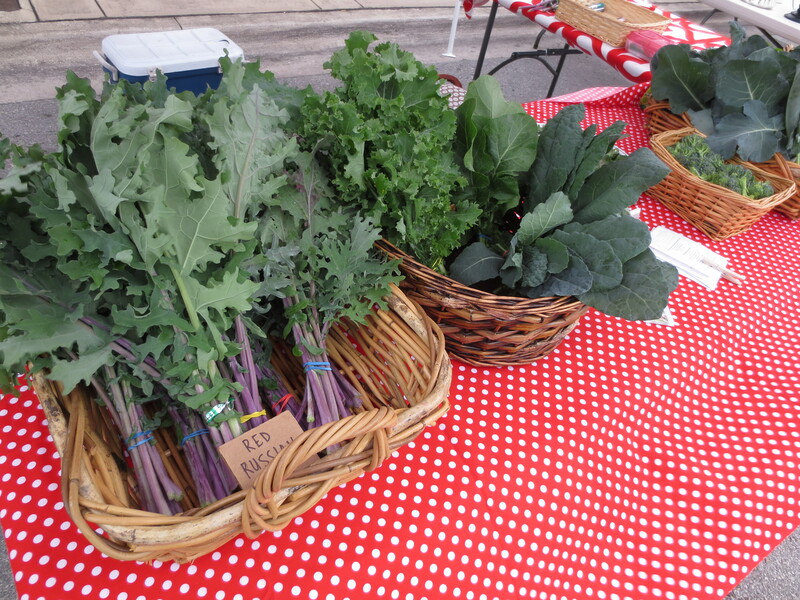 Harvest or purchase fresh local kale. We used red Russian, but any variety will do. 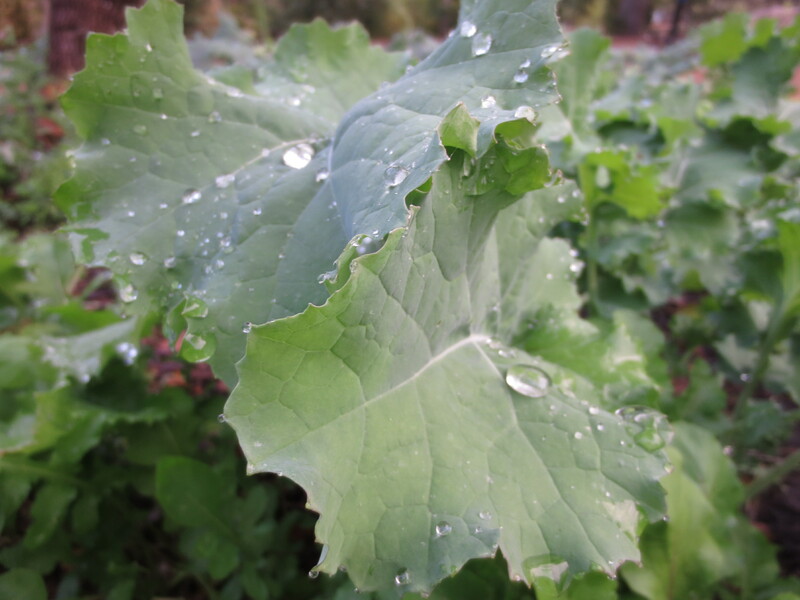 Siberian kale at The Food Forest. 2. Inspect for creepy crawlies or do a quick rinse. 3. Roll leaves “burrito style” and chop at an angle to get small pieces. 4. Add leaves to a large bowl, drizzle with olive liquid (the juice in your jar of olives). Alternatively, you could use olive oil and salt. 5. Massage! Really squeeze those veggies to get the cell walls broken and a wilted texture. 6. Add any other chopped veggies you’d like. We added carrots, snow peas, garlic chives, basil, rosemary, nasturtium, and probably much more. 7. You can also make a dressing. 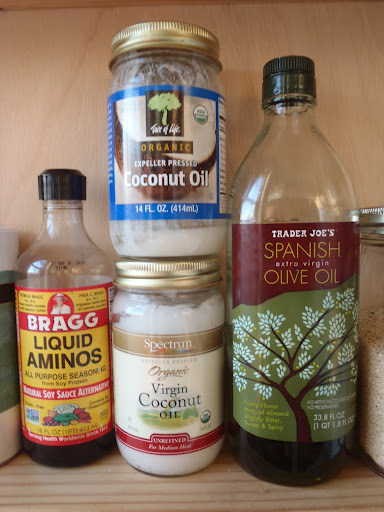 I like tahini, lemon juice, apple cider vinegar, garlic, and mustard all mixed or blended together. 8. 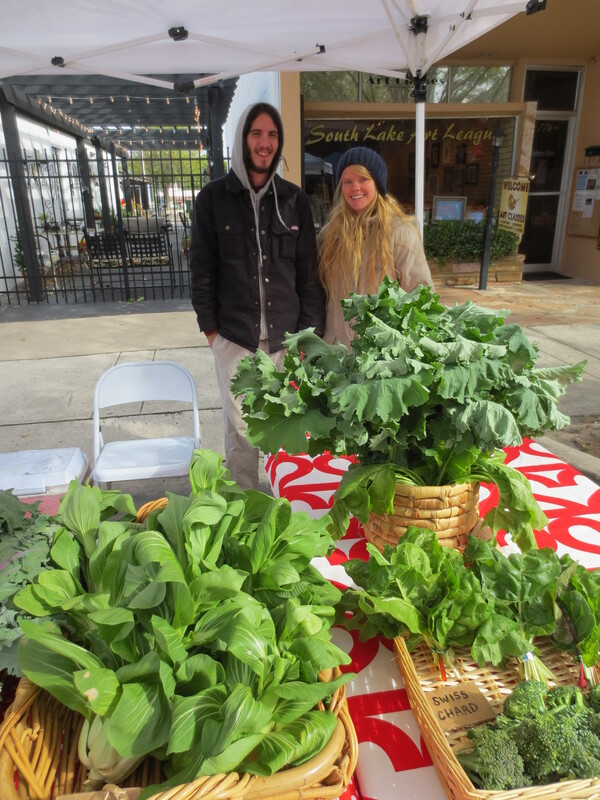 We then wrapped our massaged salad in a large kale leaf to eat as a wrap. You can also use a whole wheat flour or corn tortilla as a wrap. 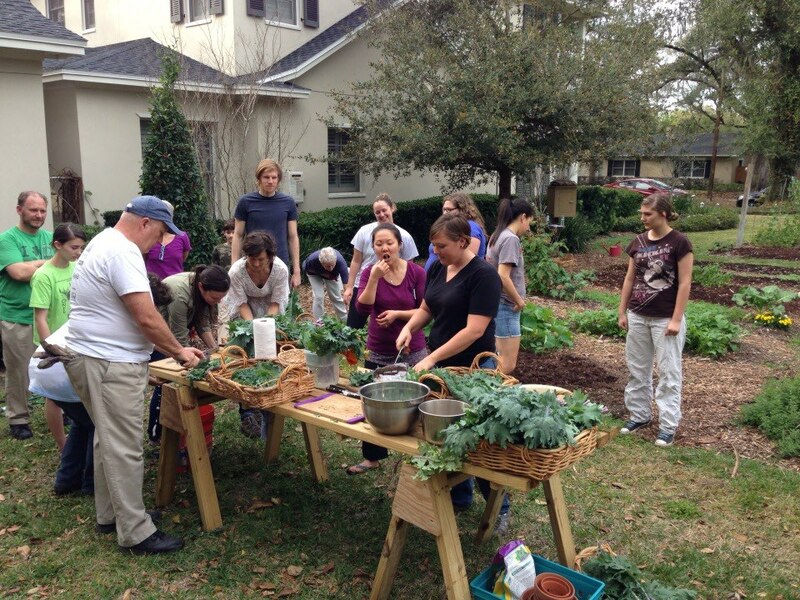 Thank you for having me Winter Park Urban Farm, and I’m looking forward to our next work and learn on March 14! 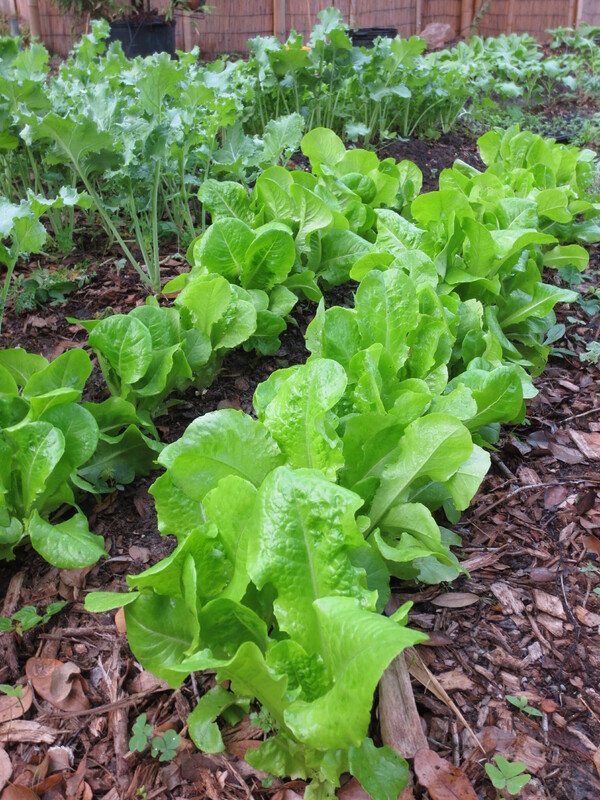 With the bounty flowing from our garden this time of year (one thing to appreciate about Florida-living), I can’t help but enjoy delicious salads daily. I posted on my Facebook last night “Kale: It’s what’s for dinner” and it was! An old friend asked me for some kale recipe suggestions. 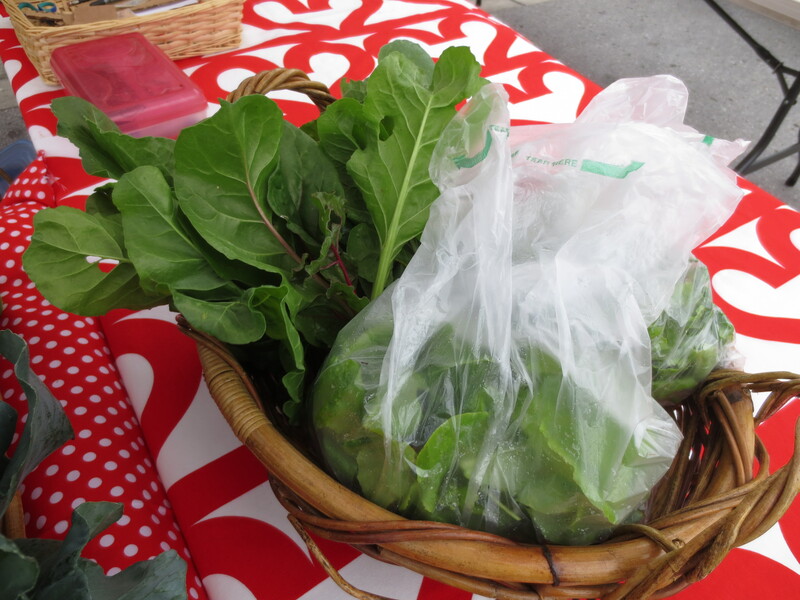 There are lots of great ways to enjoy kale: finely chopped in salads, juiced, steamed with garlic, in a fruit smoothie. However, my favorite way to eat kale is massaged. 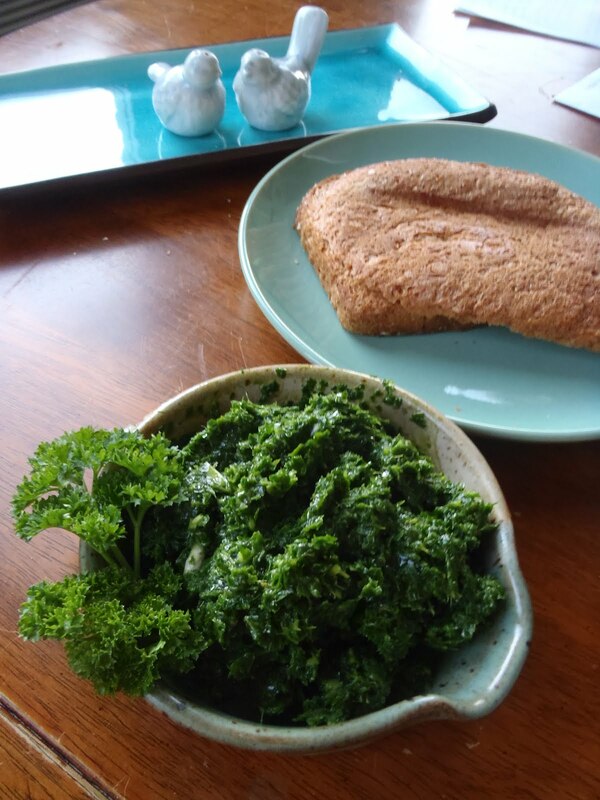 Kale is a bit tough, and the variety that I harvested from my garden last night, Siberian kale, is a bit prickly, so massaging is a way of giving the kale a wilted effect while still enjoying it raw. What began last night as an overflowing harvest of kale became, after some massaging, a healthy serving for my partner and I. He created a homemade dressing using tangelo juice, tahini, garlic, grated kumquat, olive juice, apple cider vinegar, and agave nectar. 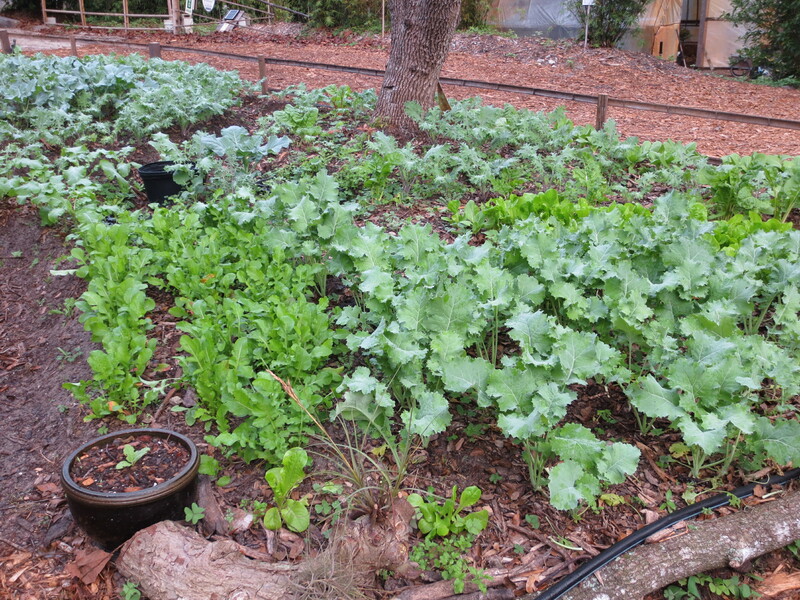 The garden: arugula, kale and lettuce, and broccoli and red Russian kale beyond. A close up of the vibrant lettuce and prickly kale behind. 1. Wash and finely chop kale. 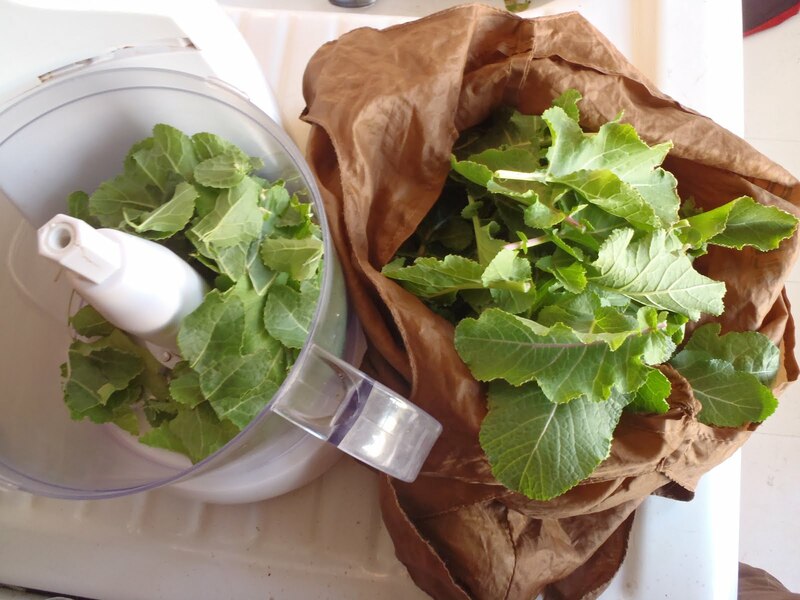 I’ve found the easiest and quickest way to chop leafy vegetables is to grab a large handful and roll them in a cylindrical bundle the best you can. Then begin slicing finely from one end the the other. I found this youtube video which shows very nicely what to do; although, you don’t have to be as precise as he is in the video. 2. Add some kind of salt to the kale. You can use dressing, olive juice, sea salt, soy sauce, etc. Add it slowly a little at a time to taste until you get a feel for how much you need. You don’t want your salad to turn out too salty. Take into account the salt content of any dressing you plan to add. The salt will help break down the cell walls of the kale to make it easier to wilt. 3. Begin massaging. 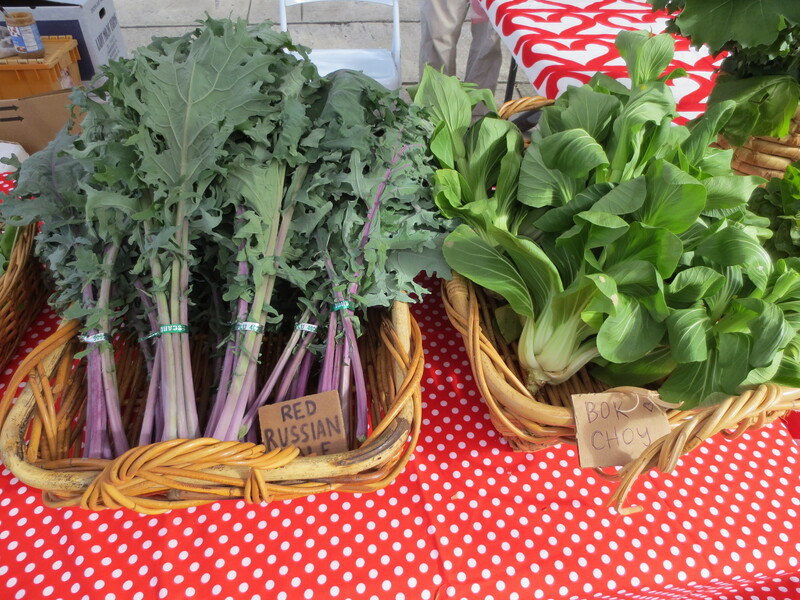 With clean hands, dig into the kale, squeezing and massaging. It only takes a few minutes to become nicely wilted. 4. Finish salad. That’s your basic massaged kale salad. Add any other toppings you’d like such as lettuce, olives, carrots, tomatoes, peppers, onion, garlic, etc. 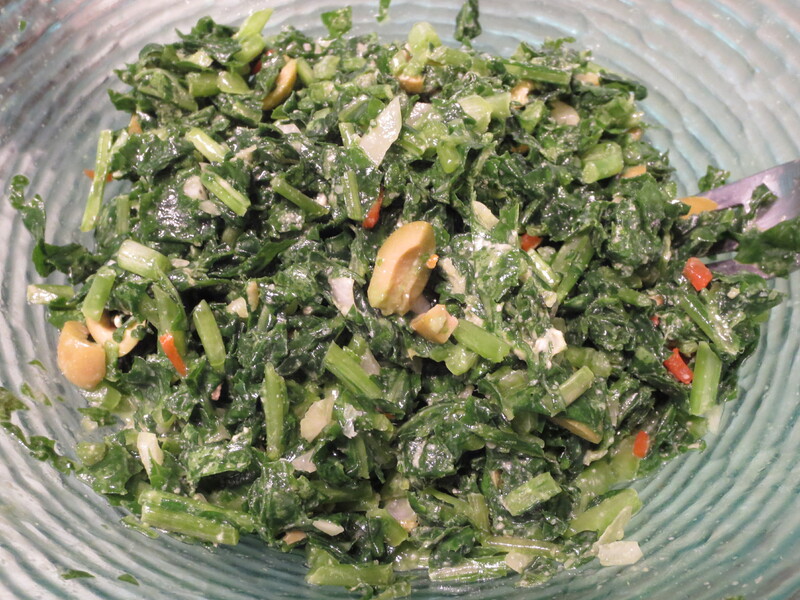 I like to add crispy greens to go with it like lettuce, arugula, or bok choy to make it a more crunchy salad. 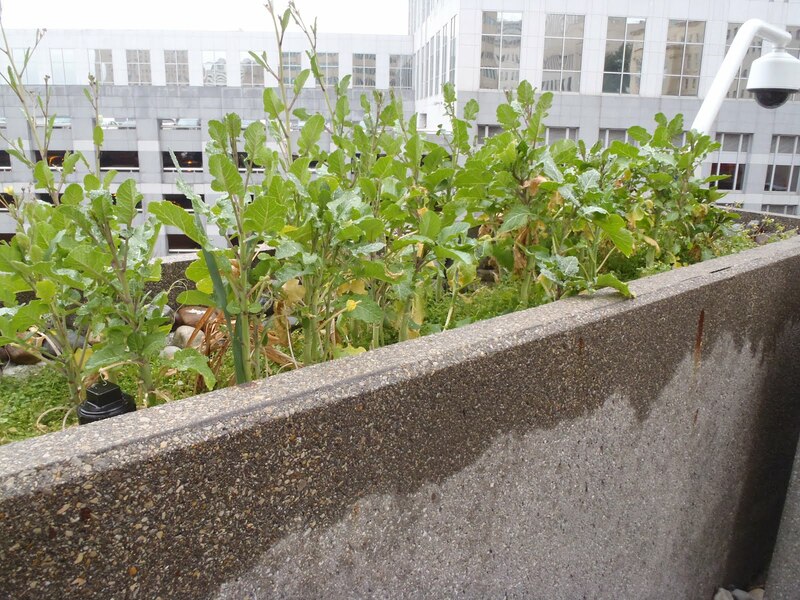 One of the neat things about my workplace is that there are raised garden beds surrounding the building in which employees grow flowers, vegetables, herbs, or whatever they wish. I signed up for a plot (and adopted one) soon after I began work in August. I grew kale! I planted a variety called Ethiopian kale; a friend gave me the seeds back in Jacksonville, FL a few summers ago. The kale did so well this fall in Richmond; however, we are having such an unseasonably warm winter, that it has begun to bolt! I decided to harvest the last of it before either, A) “real” winter comes or B) it becomes too bitter since bolting. I picked the now tiny leaves before I left work today. First, I thought I’d steam them. Then I considered sauteing them with coconut oil. Thanks to my coworker, Deb, for the coconut oil gift! I noticed that the Spectrum coconut oil she gave me smelled like delicious coconut, much more so than the Tree of Life jar I’m almost finished with. I remember being surprised upon opening Tree of Life that it didn’t really smell like coconut. Anyone have a favorite brand? My dear friend Elizabeth, who is studying nutrition at the same school I graduated from, loves coconut oil. She keeps a jar in her medicine cabinet and a jar in her kitchen. 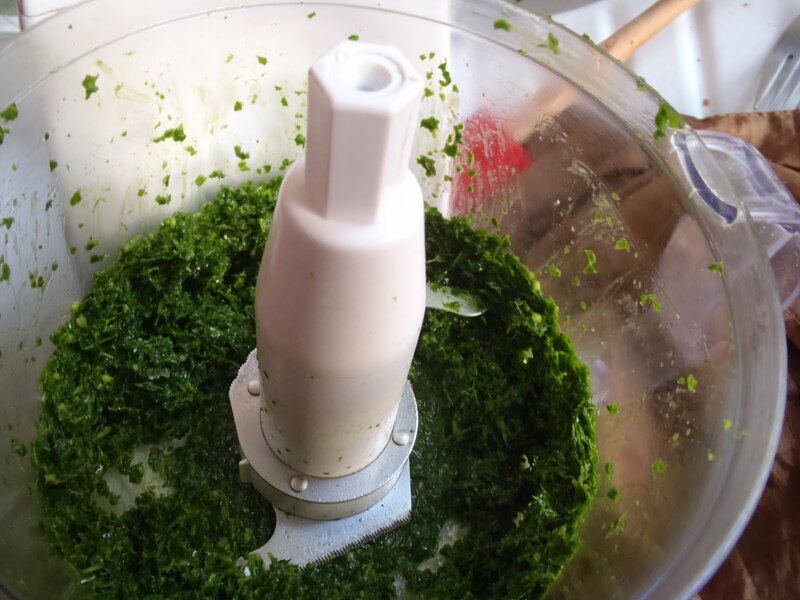 Peel kale from tough center stalk and put in food processor. 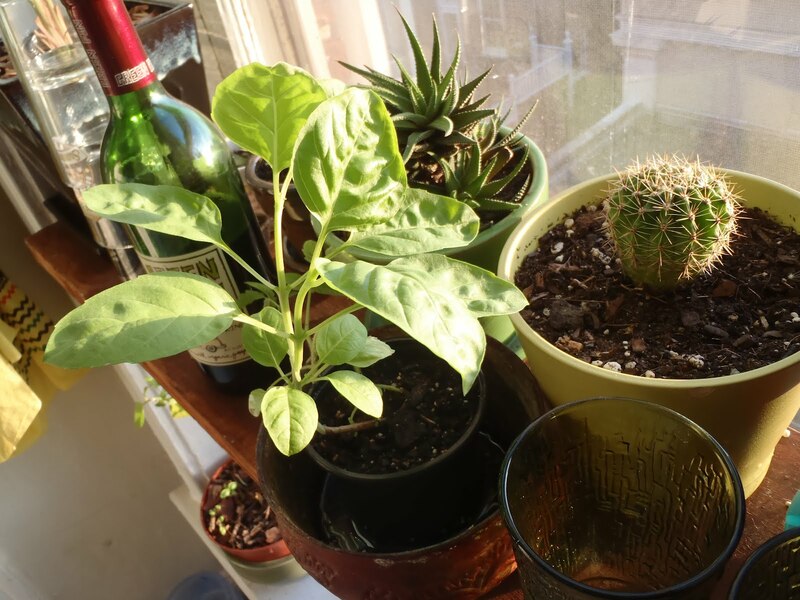 I added about 4 cloves of garlic, a lot (maybe 1/3 to 1/2 cup) of olive oil, a few sprigs of parsley, a few fresh basil leaves from my window plant (which is doing so well! ), a touch of salt, and hit the blend button. I was a little worried that it would be too bitter… It was delicious! I ate it on toast, and it smelled wonderful! 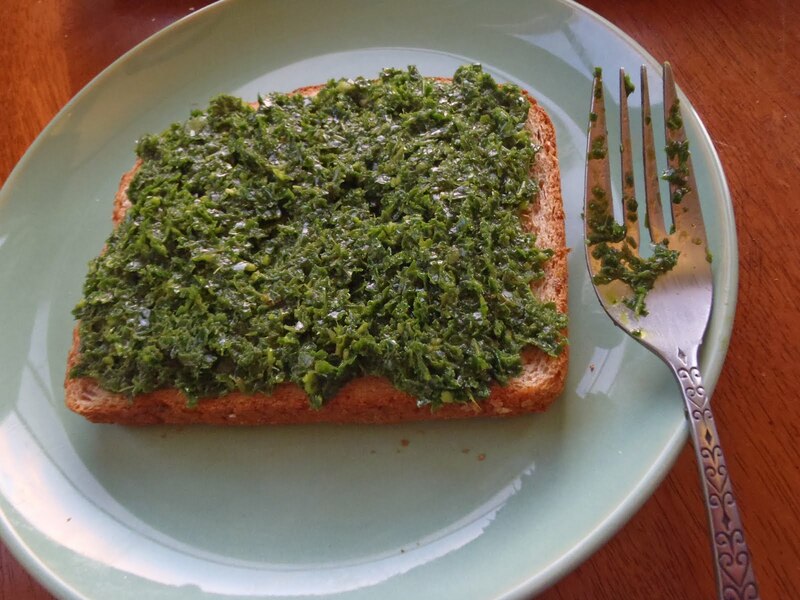 Pesto: a nutritious, versatile, raw, tasty, meal or snack.